The depth of flavour of this oil make it perfect for using raw in dressings and to finish off soups and other dishes. Mix with balsamic vinegar for a delicious dip for bread. 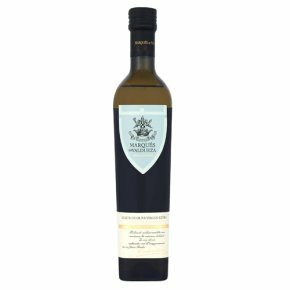 Drizzle over a warm green vegetables or dress a feta salad with this oil and red wine vinegar. For use in cooking and dressings. Suitable for vegetarians.Arbequina, Picual, Hojiblanca and Marisca are blended by oil expert, Cristino Lobillo Rios to create this gentle grassy oil with great depth and balance. Very smartly bottled, we feel it is a great addition to our range, and is the first Spanish oil to really take on the Italians.